Senior defender Justin DaSilva skates the ice Nov. 20 during a game against Michigan State at the Schottenstein Center. OSU lost, 2-1. Michigan bullied the Ohio State men’s hockey team in Yost Ice Arena, putting the Buckeyes (5-9-1, 1-2-0-0) in a pinch ahead of their nearly month-long break. OSU’s, 8-3, loss to the Wolverines (8-6-1, 2-1-0) last Friday was the team’s latest setback in its search for an identity. The Buckeyes have gone 4-6-0 in their last 10 games, taking a four-goal and five-goal loss in that stretch. Team confidence, according to OSU sophomore forward Nick Schilkey, is scrambled. 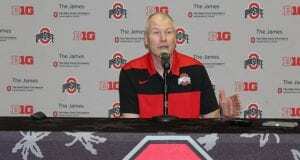 The Buckeyes’ losses have not been from repeating the same problems, Buckeye coach Steve Rohlik said Friday. The trouble was penalties on Friday, as OSU was stung by 19 penalty minutes against Michigan, nearly seven minutes more than the team averages per game. 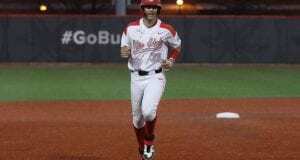 During the Buckeyes’ 5-1 loss to Western Michigan last weekend, the trouble was effort, Rohlik said. 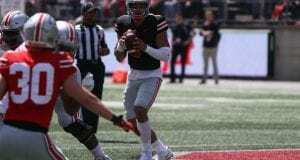 These reasons gave relief to what could be considered OSU’s most discussed difficulty of the early season: playing from behind. The Buckeyes have allowed the game’s first goal in nine of their 15 games. 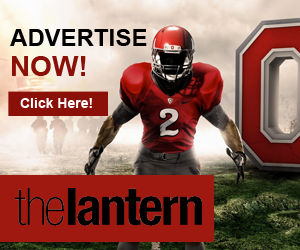 That latest trend may be on the decline, as OSU scored first on Friday for the third-consecutive game, but the early advantage only magnified the defeat. After taking a 1-0 lead on Friday, the Buckeyes took multiple penalties to allow four power-play goals in the second period, including two during a five-minute man advantage after OSU senior forward Nick Oddo was ejected for head butting. The Buckeyes’ play became more disconnected as their deficit grew. After OSU senior forward Matt Johnson opened the scoring, the Wolverines tied the game, took a 2-1 lead with 12 seconds left in the first period, then scored six more goals. Buckeye goals from Schilkey and junior forward Anthony Greco registered only in the box score. Momentum was completely lost after OSU’s penalty kill collapsed and the team trailed 7-2 after two periods. Defensively, OSU’s goaltending inconsistencies persisted. Sophomore goalies Matt Tomkins, Christian Frey and Logan Davis each saw action. 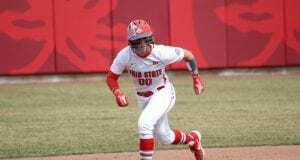 The loss followed OSU’s 6-2 loss to Western Michigan and 5-1 win against Notre Dame last weekend. The Buckeyes’ played worse in their four-goal loss to the Broncos than they did on Friday night, Schilkey said. After the game, a tight-lipped team walked with tucked heads as they exited Yost Ice Arena. Body language was telling. Empty silences filled responses to postgame questions. The team that had won two of its last three games had been humiliated. 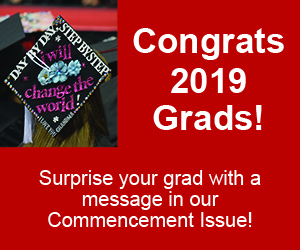 The break will also be used for learning as Rohlik indicated the Buckeyes’ resiliency is a good trait, but the team needs to understand how to string together wins like its strung together losses. As Shilkey emerged from the locker room on Friday, he set down his equipment bag and proceeded to respond to the question his team needs to answer: What now? “We’ve got a month here to figure out what team we’re going to be,” Schilkey said. 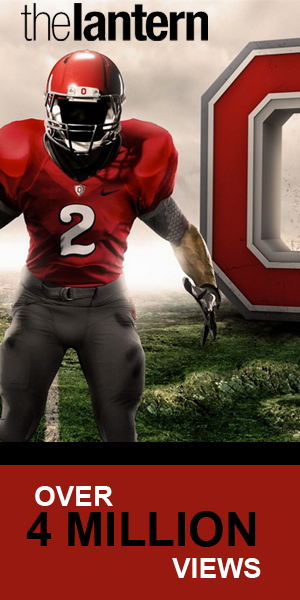 In less than a month, the Buckeyes will know. -OSU will next on Jan. 2 against Mercyhurst University in downtown Erie, Pa.